I have good news, bad news, and sad news. The good news. On two occasions I’ve seen a pair of Downy Woodpeckers in the lilac trees in front of the house. New yard birds! The bad news, I haven’t yet been able to get a picture. No proof, and I’m not sure if they’re just passing through or new residents, but I’ll keep an eye out for them. 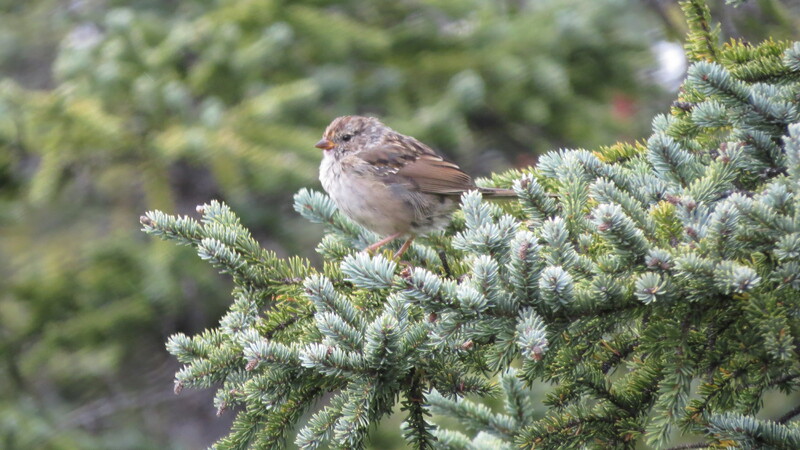 On a different day, I came home and noticed the song birds were quiet. 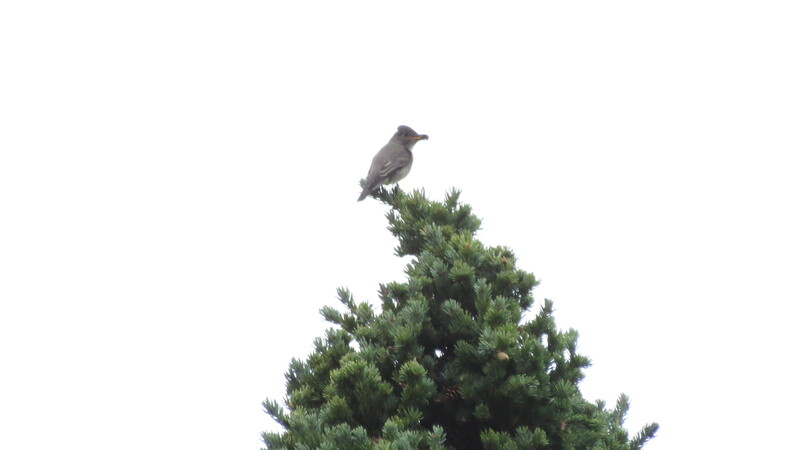 Then I saw a medium-sized bird fly to a nearby Douglas-fir. The flight pattern caught my eye, it was unlike other “medium” birds’ flight patterns I typically see around the yard like crows, pigeons, etc. Luckily, I got a picture of this one. 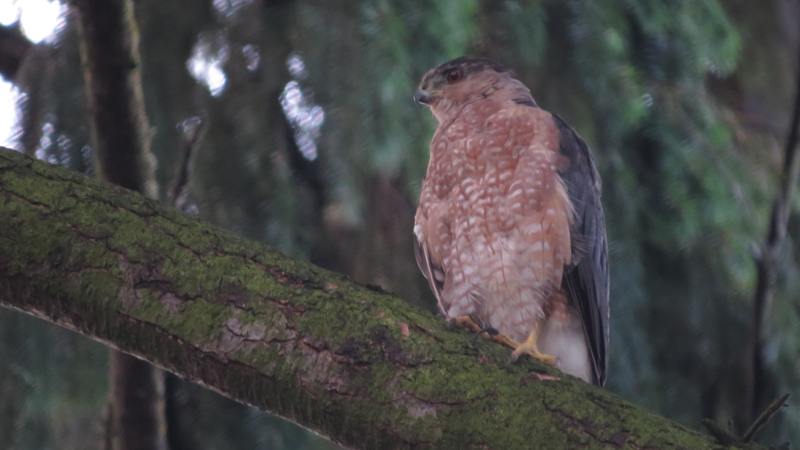 Accipiter on alert! No wonder the song birds were silent. 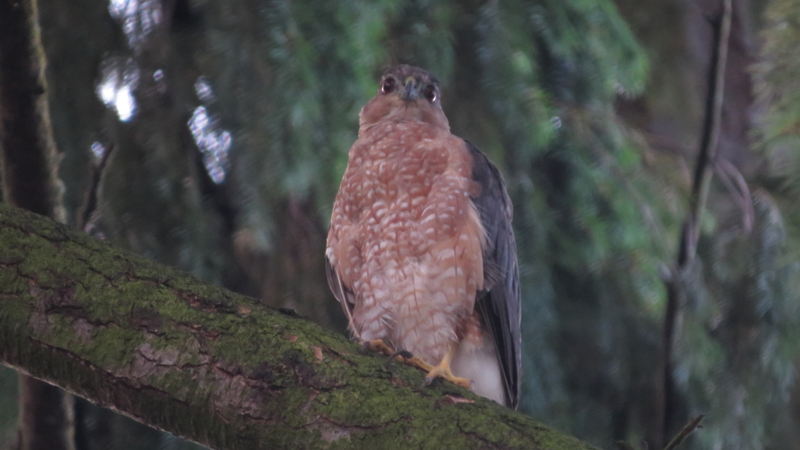 I’m leaning toward Cooper’s Hawk on this one (based on the head size and eye position- feel free to correct). 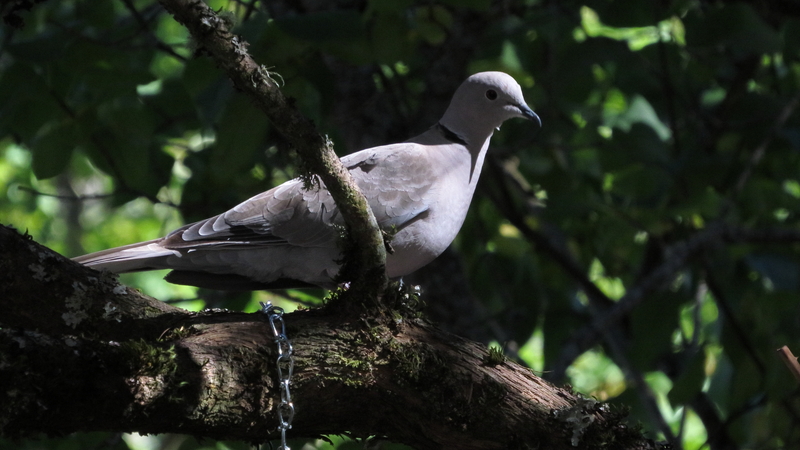 Another common urban bird, but new to my yard was a pair of Eurasian Collared-doves. I got a picture of one before they flew away. As long as the coast is clear, I’m sure they’ll be back. 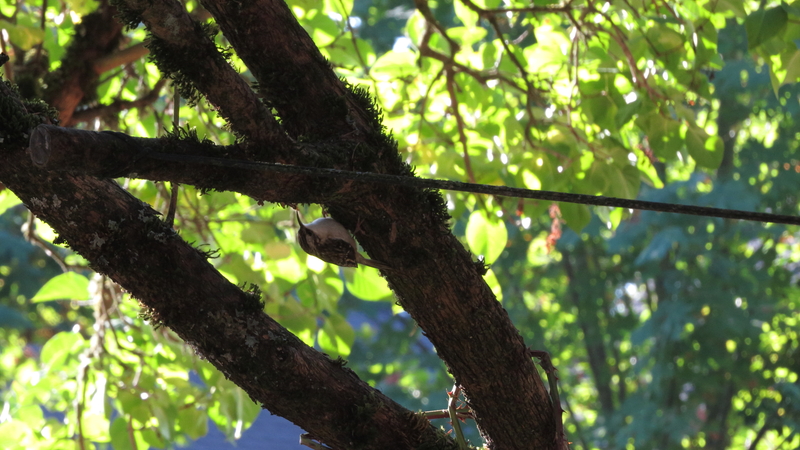 And we also have a Brown Creeper. I’ve heard it, but hadn’t gotten a visual until now. Pretty cool. 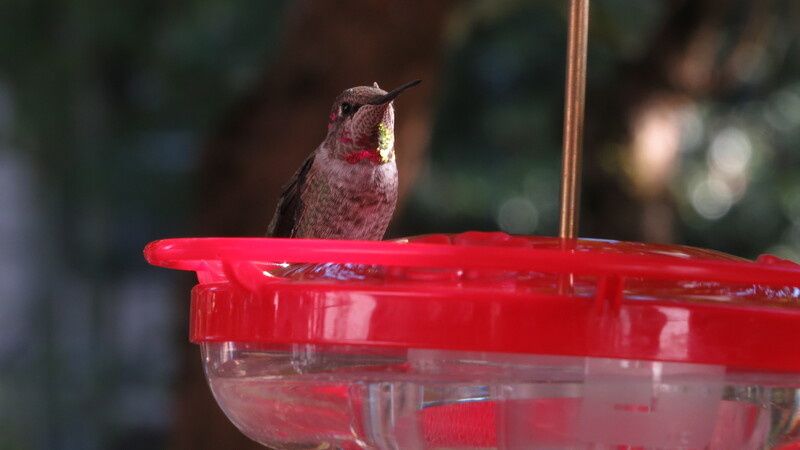 I commonly see gobs of Chestnut-backed and Black-capped Chickadees, Red-breasted Nuthatches, Bushtits, Dark-eyed Juncos, Song Sparrows, Western Scrub-Jays, and of course, lovely Anna’s Hummingbirds. The yard continues to keep me happily entertained. I’ve added a second suet feeder and bird feeder to keep peace and hopefully attract a migrating bird or two. 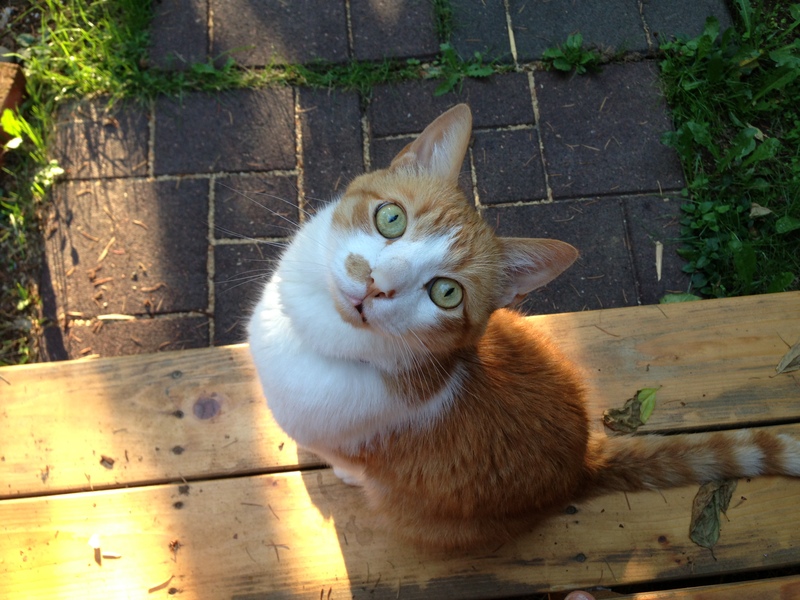 In sadder news, I lost a sweet furry companion in my life, my 16-yr old cat, Benjamin. He lived a long, fulfilled life and his kidneys decided it was his time for him to go. Birds and cats do not mix. I bring up his death because dealing with grief highlights the things in my life that bring me joy. I’m focusing on the things that make me happy. A big part of that is birds and birding. It’s comforting to know they’re still there. Birds will go on, that’s the good news. Before going to Denali, I did my homework. There was a slim chance we’d be eaten by bears and I wanted that chance slimmer. Planning is key (*see end notes). We traveled by train- the Denali Star, to reach the park. I humored the idea of birding by train, but that was pretty much impossible. 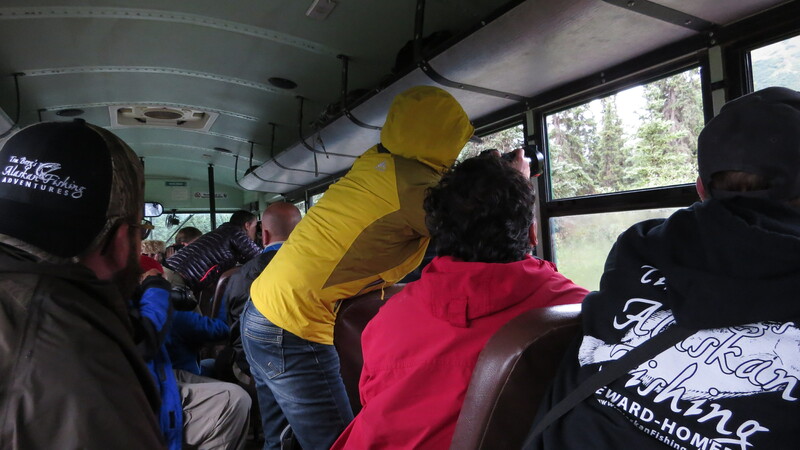 The conductors did, however, point out Osprey nests and Trumpeter Swans as we whizzed by. 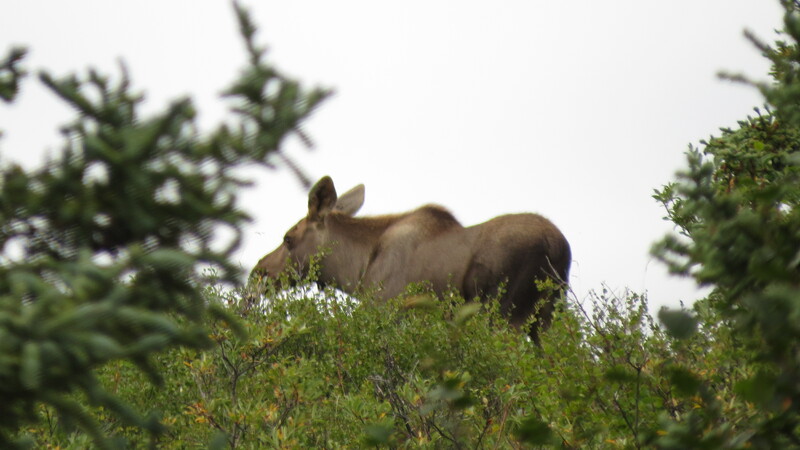 We also had our first moose sighting by train. 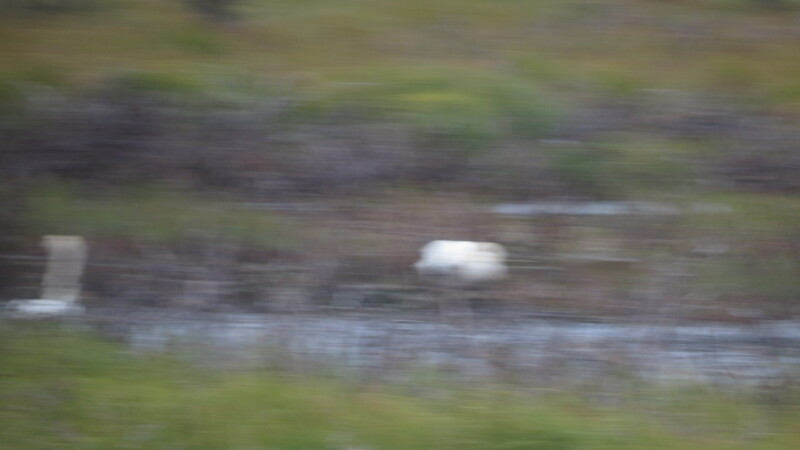 I went to Alaska, and all I got was this blurry picture of Trumpeter Swans. I had hoped to see a Willow Ptarmigan (related to pterodactyl, obviously) on our Alaska trip at some point. 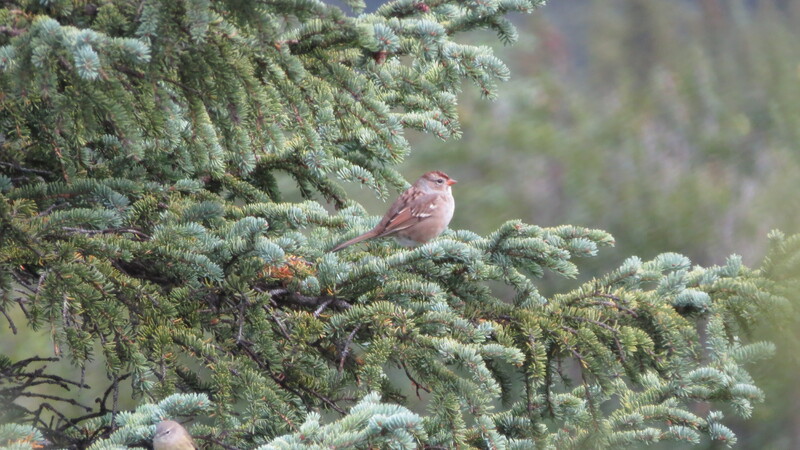 A “typical bird of the arctic tundra.” Spoiler alert – I did not see one. The closest I got was seeing two round “bird-like objects” flee for their lives from the shrubs alongside the moving train. 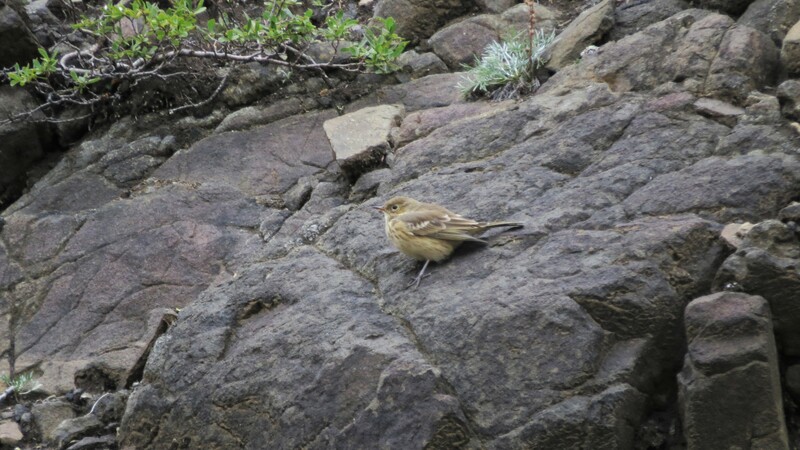 Possibly ptarmigan, but unconfirmed. After the eight hour train ride, we finally arrived at the park. We completed the required backcountry training, picked out our backcountry unit (unit 6, my first choice! 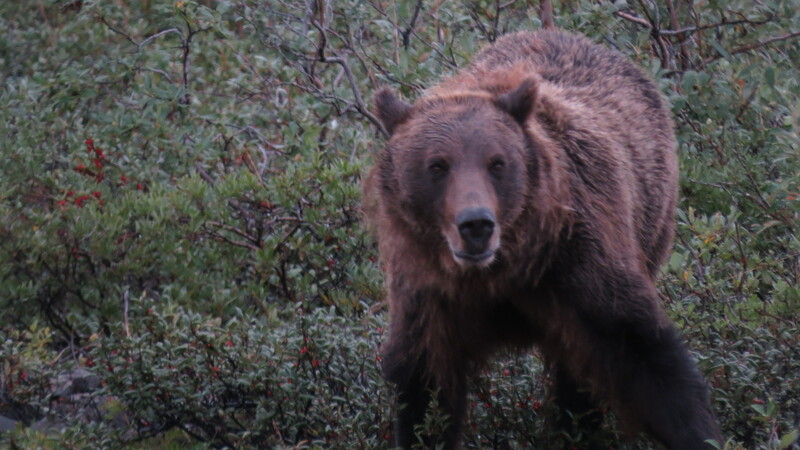 ), acquired our bear resistant canisters, and stayed the first night near the park entrance at Riley Creek Campground. Where it rained. And poured. And rained some more. We arrived at Wonder Lake and set up camp. It is a surreal place. Beyond those clouds, only 26 miles away, is the highest peak in North America, Denali, “The High One.” Wonder Lake is the closest campground to the mountain, but living up to its reputation, the peak was obscured by clouds. 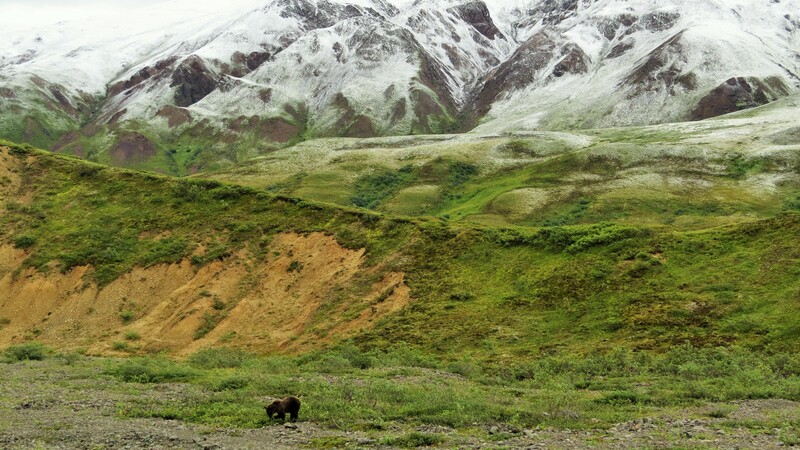 Only 30% of Denali park visitors are fortunate enough to see the mountain. We set off for a hike on the nearby Mckinley Bar Trail, one of the few established trails in the park. Here I focused my attention on the partly obscured birds. 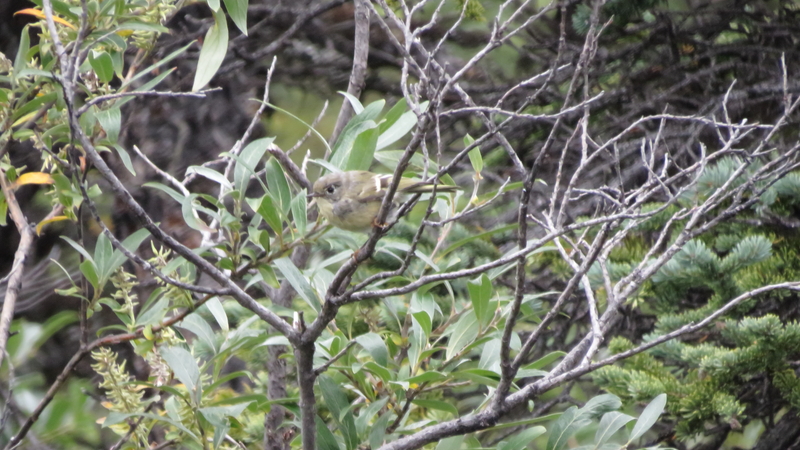 We saw flocks of Wilson’s Warblers (not pictured: the rest of the flock). 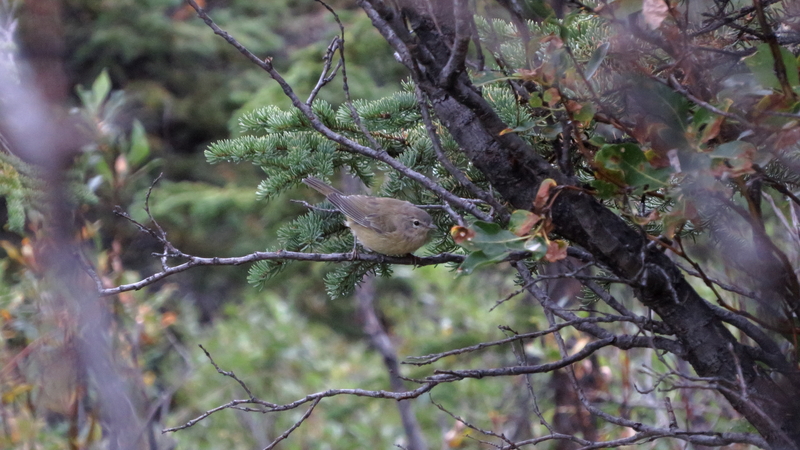 We saw a few other “common” birds. 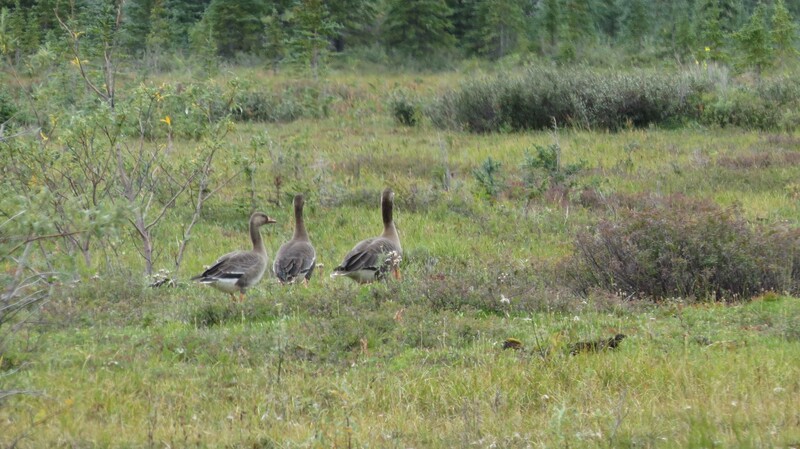 These Greater White-fronted Geese were kind of a surprise find while exploring the trail. 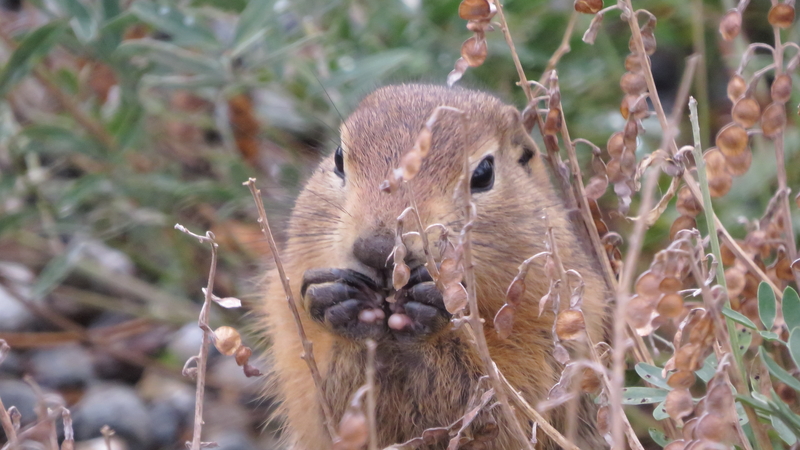 We could finally put into practice what we’d learned to do during a wildlife encounter. Speak calmly, and back away. 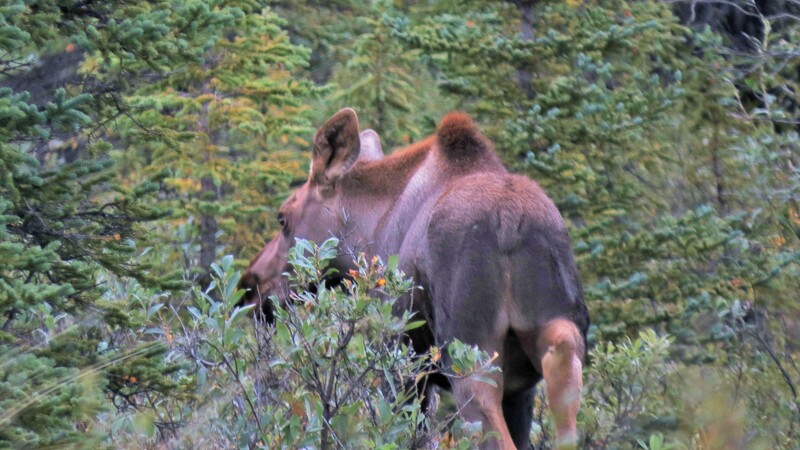 Moose want their space, and they’ll charge you to get it. 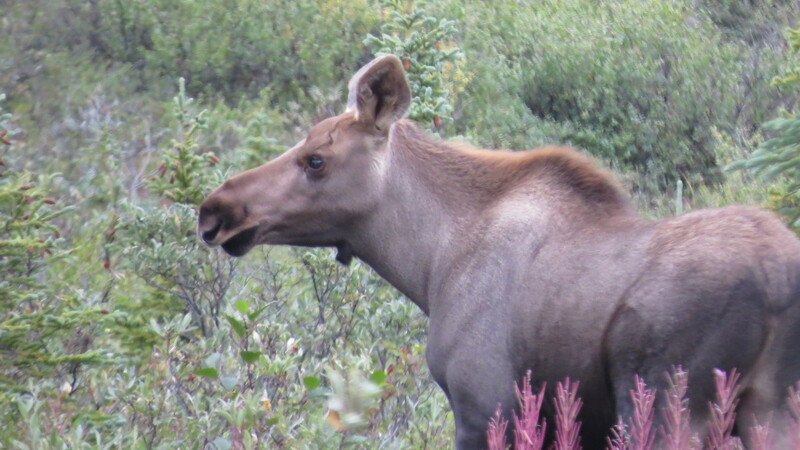 This one was directly on the trail in front of us, so we made a large circle around the tundra to avoid her, meanwhile keeping her within eye-sight, as she kept an eye on us. We were nervous she may have a calf, but we never saw one, and she continued munching on the brush, and eventually moved on into the thickets. Whew. It was good practice for our next few nights in the backcountry where we would experience the most remote hiking we’ve ever done. 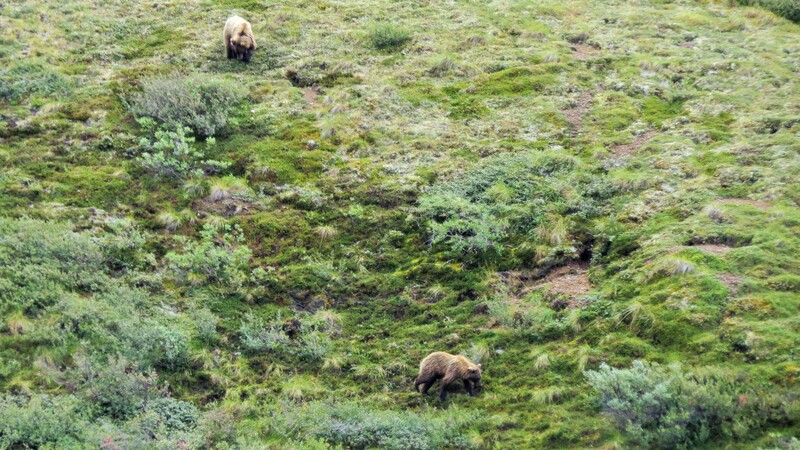 How backpacking Denali works: The 6 million park acres are broken into 87 backcountry units. 41 of the (more accessible) units have a quota (2-12 people). A (free) permit must be obtained in-person from the Backcountry Information Center (BIC) to access units. 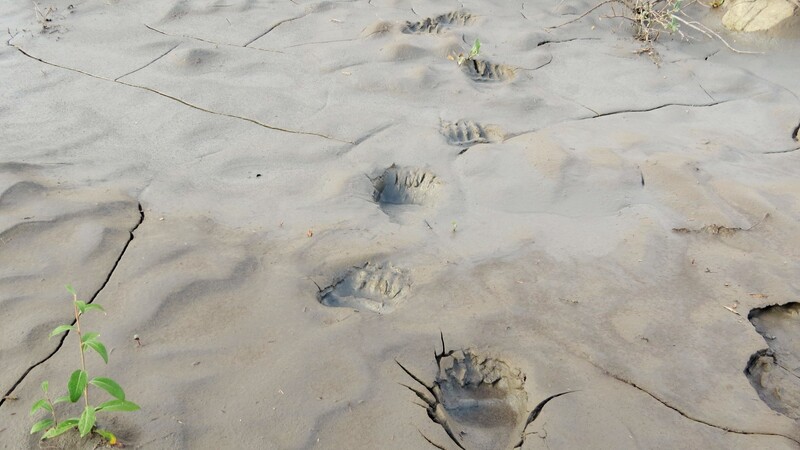 Along with paperwork and using/borrowing bear-food canisters, they require a basic training process for hiking in bear country (video/instruction). In all, it took us 2 hours at the office to pick a unit and complete training. (About 1.5 hours longer than I thought it would). Denali has one 92 mile road. 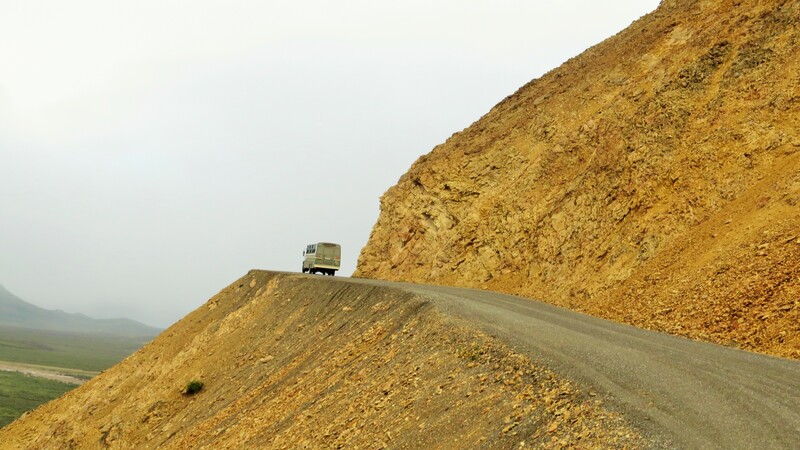 In summer, only the first 15 miles of the road is accessible by car. Shuttle buses are the way to access the park, but camper buses specifically are the way to access with camping gear (backpacks and bicycles). There’s a difference between the buses – I learned that the hard way. Because of the unit quotas and in-person permit requirement, popular units are often full. One trick is to stay a night (or two) at Wonder Lake (last stop) because they will allow picking units for the following nights after WL, giving you a head start. Wonder Lake is also close (26 mi) to Denali (mtn). A shuttle bus departs Wonder Lake pretty early that can then make a drop off at a desired unit location. I found it inspiring and helpful to read trip report blogs, blogs, and more blogs. Even Trip Advisor has some knowledgeable insight from a few locals. And Backpacker guide has a trip suggestion. For bear safety, aside from the backcountry video and safety talk at the park, we found this entertaining video produced by Mirror Lake Middle School. Go. It’s all worth it. “I go to nature to be soothed and healed and to have my sense put in order.” – John Burroughs, naturalist and nature essayist. 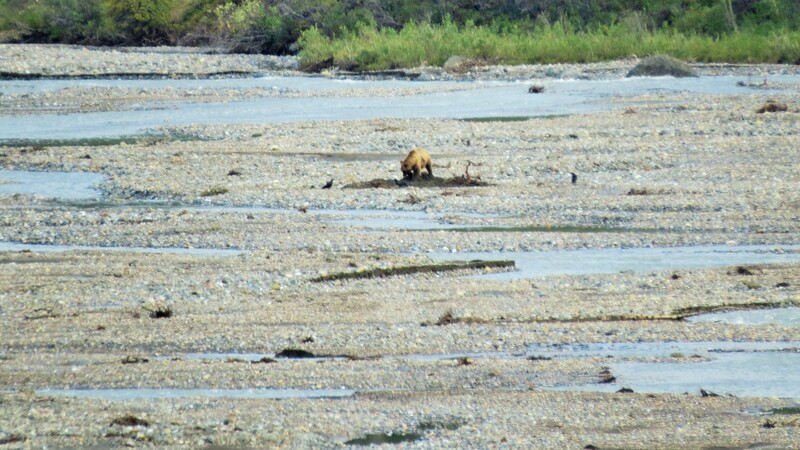 We saw five grizzly bears from the shuttle bus on the way towards our unit. Intimidating, much? We prepared for such encounters as best we could before setting off into the backcountry. 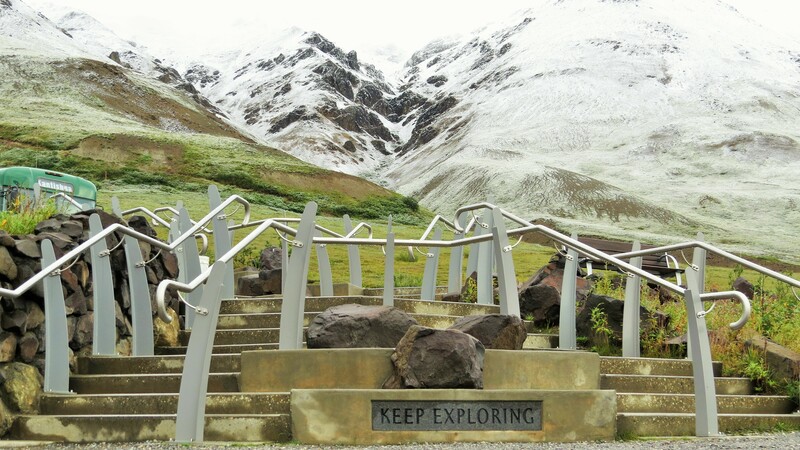 Hiking in Denali has a few requirements. 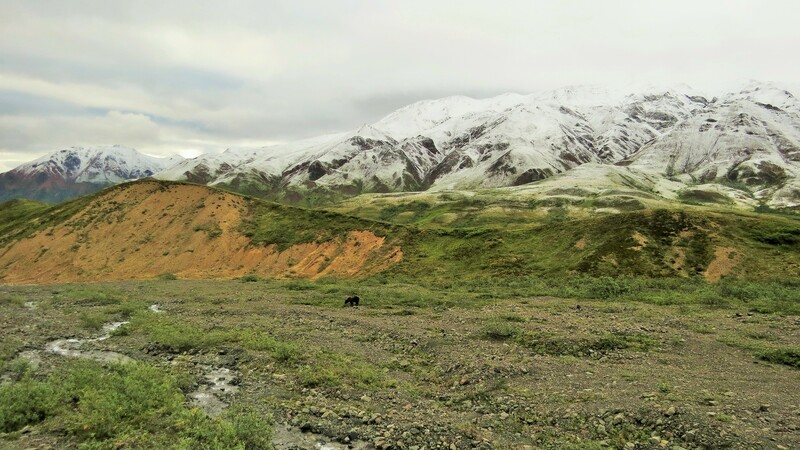 Contrary to Pacific Northwest training to walk single file along trails, Denali hikers are to spread out, preventing new trails and minimizing impact. Hiking alone is not recommended. And when in areas with limited visibility, make noise. Talk loudly, sing, or call out, “Hey bear!” at regular intervals, so as not to startle any bears. No kidding. This tactic gives wildlife a heads-up of your approach so they’ll (presumably) scatter. That last tip is probably the worst for birding. 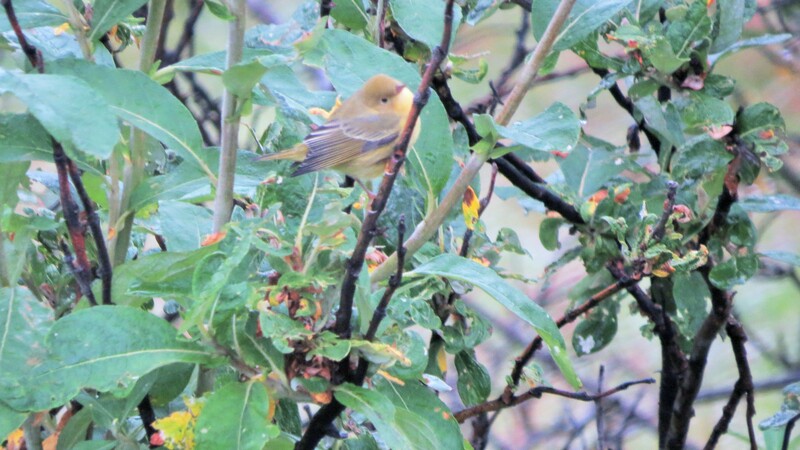 But, determined to survive (*and* see birds), we tromped through the thick, brushy alder, and repeatedly announced “Hey bear!,” spoke loudly, and sang silly songs like “99 Bottles of Bears,” “Alphabet-booze-bear-bird,” or anything else we could come up with. It’s a fun challenge to see where the mind goes when you’re hiking for miles over tundra, tired, and talking non-stop. 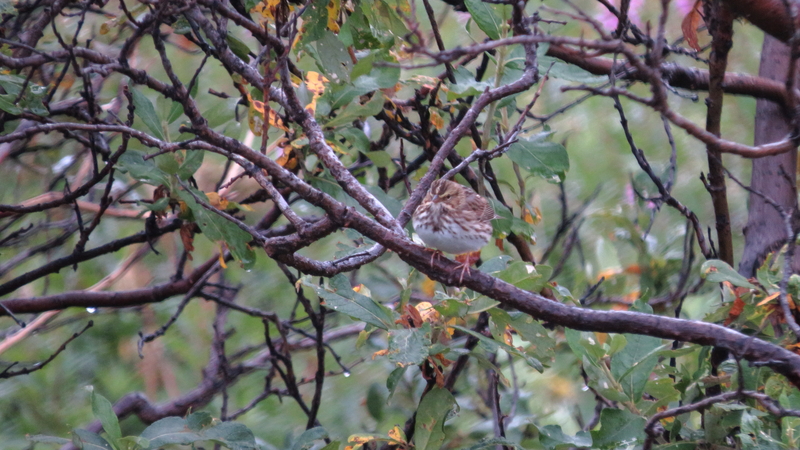 Despite the singing, I found a few new birds! 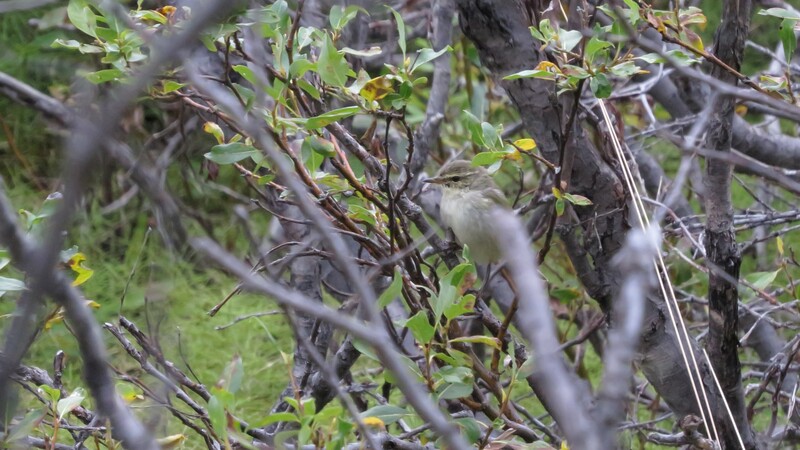 I feel pretty lucky to have glimpsed this Arctic Warbler, that was “solitary, secretive, and skulking” in vegetation. 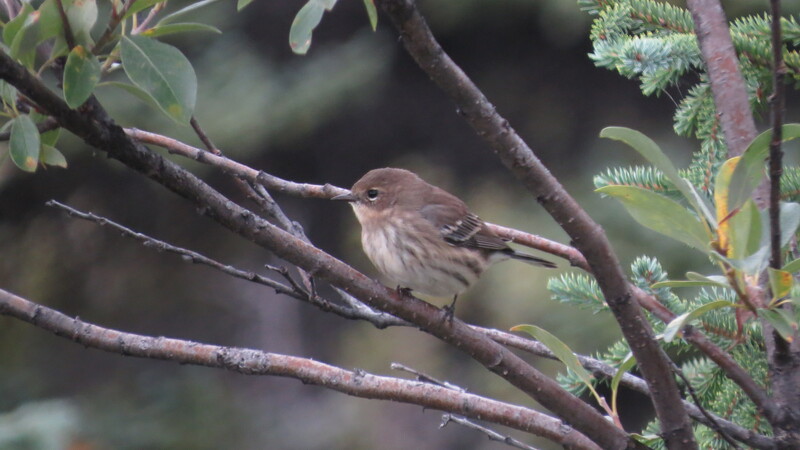 Phylloscopus borealis, Greek origin, Phyllon – leaf, scopio – seek, appropriately “spends much of it’s time feeding in the leafy canopies of trees.” Amazingly, this little bird breeds in North America (Alaska), then migrates across the Bering Strait to winter in Asia. 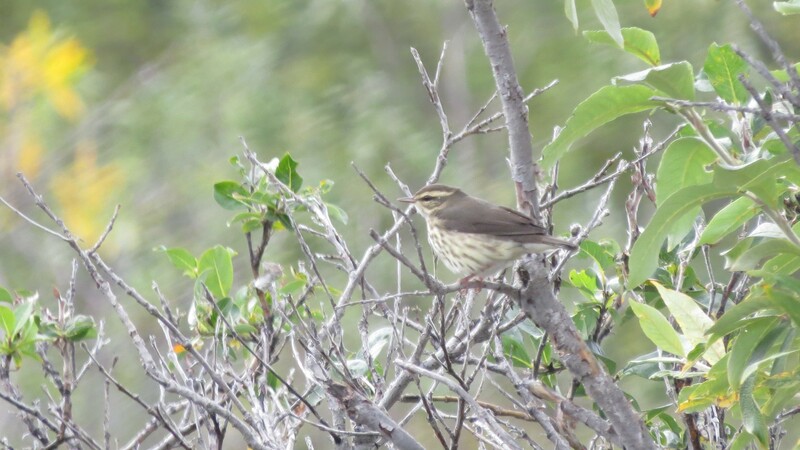 Another great find was this Northern Waterthrush, Parkesia noveboracensis – Latinized form of “Parkes’s” (named after the ornithologist, Kenneth Carroll Parkes) and “New York.” The Northern Waterthrush is a ground dweller that walks rather than hops, bobs its tail rapidly, and is a similar species to the Louisiana Waterthrush. 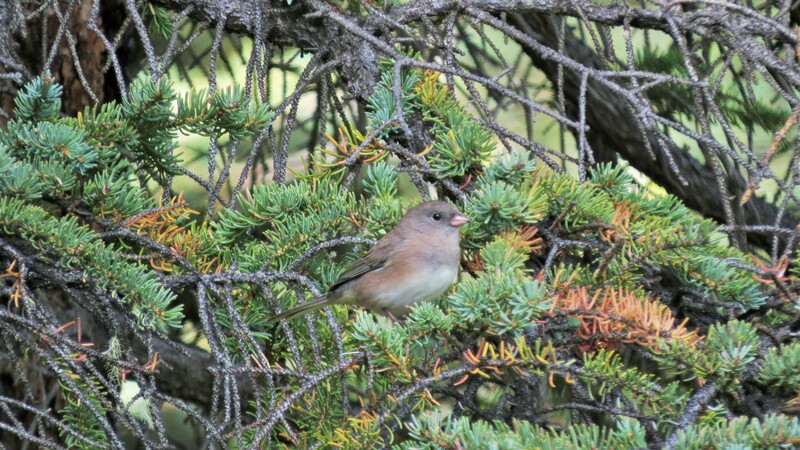 We saw what is sometimes called the “snowbird” in Alaska, the Dark-eyed Junco- Slate-colored model! 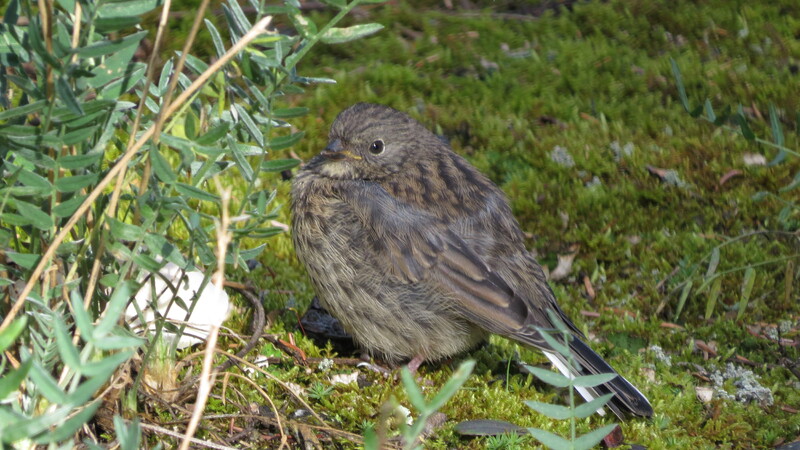 (and juvenile below). 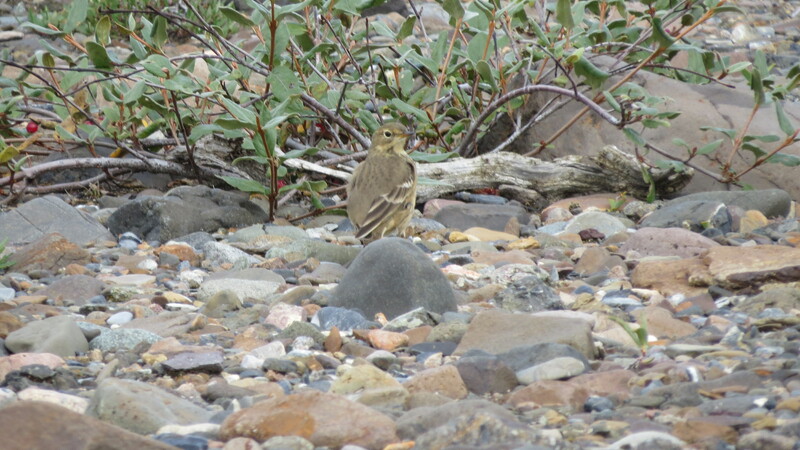 American Pipit, a species I once saw by the Columbia River near home, flocked along the Alaskan riverbars. 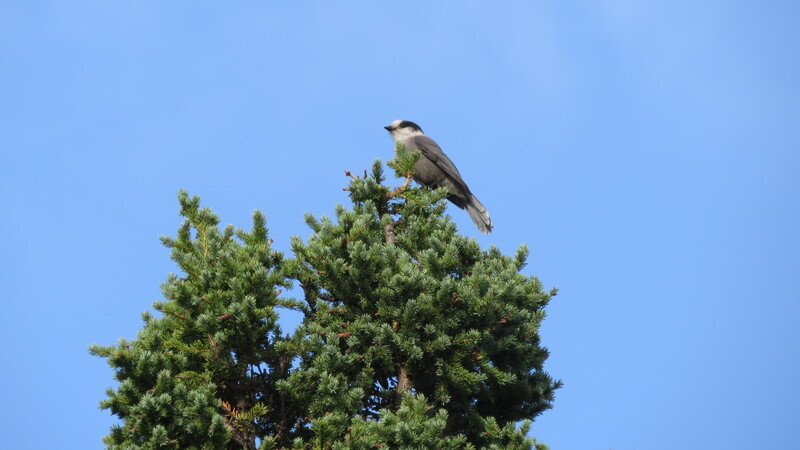 Gray Jays. Gregarious. And everywhere. 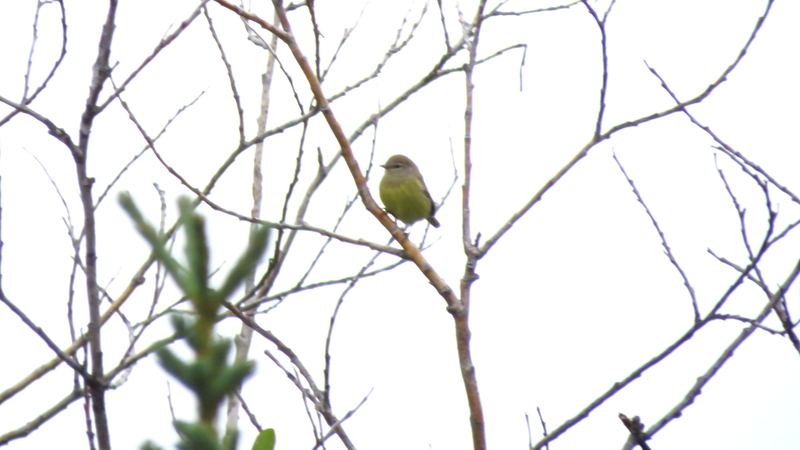 Olive-sided Flycatcher. I totally recognized it. 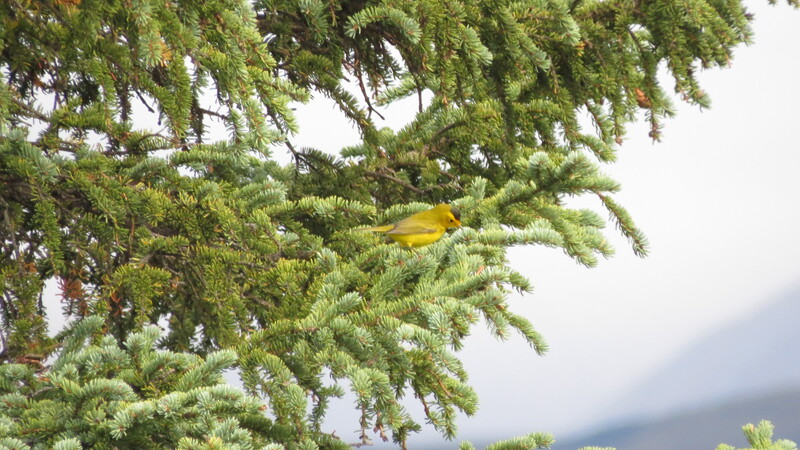 Orange-crowned Warblers. Totally didn’t recognize them. 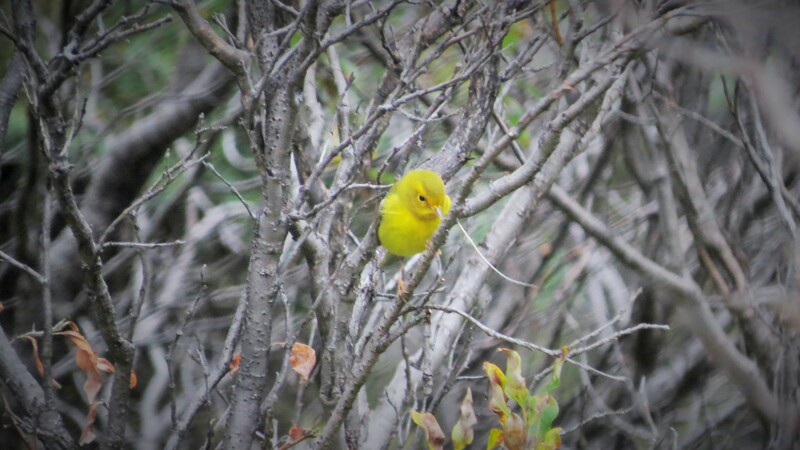 Nor did I recognize this Yellow Warbler, since it was wearing it’s “first-year buffy/brown” outfit. So tricky. 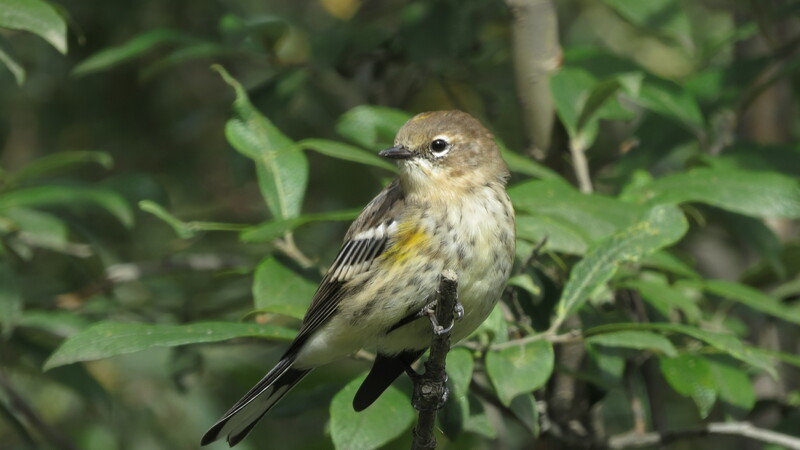 And, everyone’s favorite, Yellow-rumped Warbler. 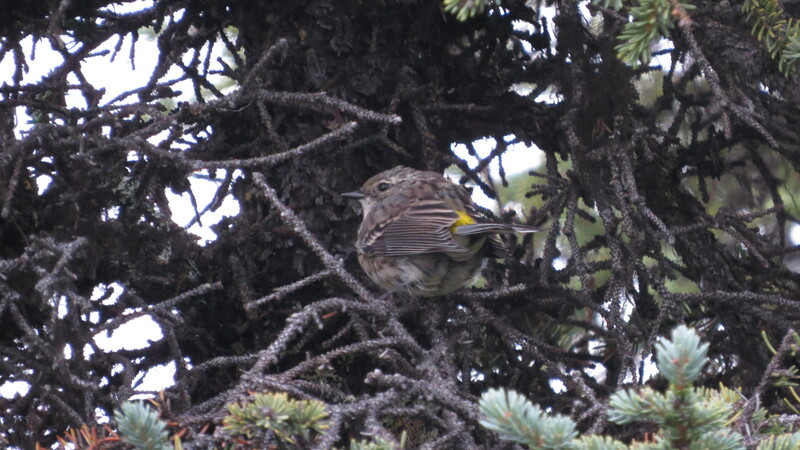 And because these pictures turned out the best, more yellow-rumped beauty. Denali backcountry is amazing. I’m in love with the park for keeping it simple. There aren’t millions of RVs, cars, and people obscuring the view. We saw no signs of humans in the backcountry aside from footprints. It’s wild and beautiful (as national parks should be). 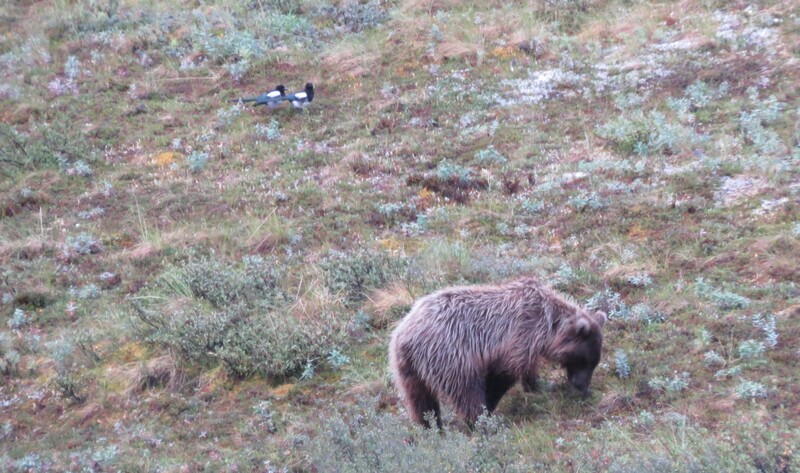 Bears, snow, remote, and birds? It’s all worth it, keep exploring.